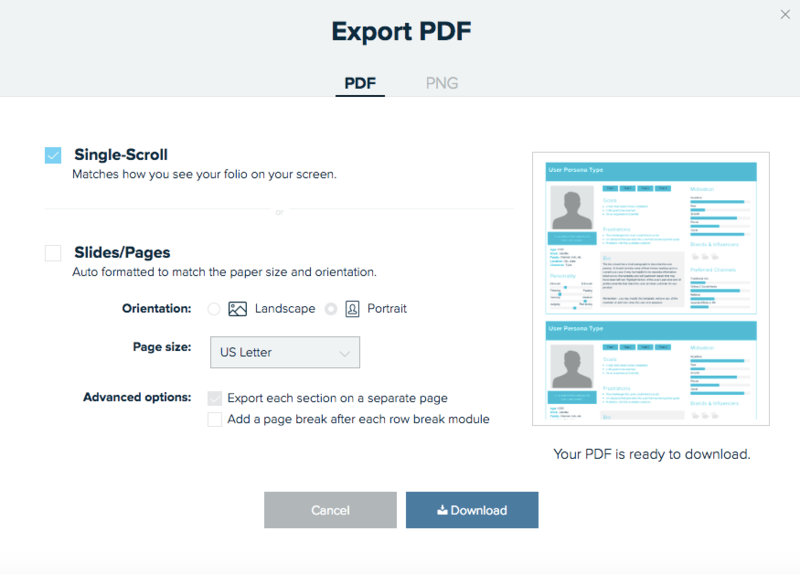 On Xtensio’s premium plans, you can export your folio as a PDF or PNG file. Free users can also buy export credits that never expire. When you click “Download PDF,” a pop-up will appear with options for Single-scroll vs. Slides/Pages view. When you choose to export your folio as a PDF in slides/pages, you’ll have additional options to choose page orientation, paper size and page breaks. By default, the “Single-scroll” option is selected. When you Export with this option, you are creating a single, auto-sized PDF. This will take on the height of your folio with no page breaks. You will see a preview of the single-scroll automatically populate when you open the exporter. Click ‘Download‘ to export the PDF. This option is ideal if you want to: view your PDF on a screen as a single scrollable document, embed a single PDF onto a site, or include your PDF in an email. TIP: The width of this PDF will be based on your browser window size. If your browser width is smaller, you’ll have a smaller margin on the left and right sides of your content. If your browser width is larger, this will add more margins on the sides. Adjust your browser window by placing your cursor on one of the borders and dragging in or out before exporting as a single-scroll to adjust the margins on your PDF export for screen. You can also export your folio as a PDF optimizing for print. If you select the “Slides/Pages” option, you’re able to define the orientation of your PDF, the size of the paper you will use, and where you want your page breaks to happen. Neither Section nor Row Break: The exporter will fit as many sections on a page as possible before the content begins to overflow onto the next page. When a section cannot fit onto a single printed page, it will be pushed to the next page automatically. Section Only: Each of your folio’s sections will be displayed on its own page. Row Break Only: If you add Row Break modules to your folio, this will force any content after the Row Break module to start on a new page. Both Section and Row Break: Each of your folio’s sections will be displayed on its own page. If you have Row Break modules in place, this will force another page break within that section. Break your printed pages by Sections. Move and format your modules in different sections. If the content is too long, the export will still break the page, so we suggest making images or text smaller, or breaking apart some of the content onto the next page (section). Learn more about working with sections here. Use Row Breaks to force where page breaks happen. The Row Break module adds extra space between modules to center the content. You can also add these to help you achieve full background images on the page. If you select the option to break pages by Row Break modules, you can place these in your folio to force where page breaks happen. Once you set your export customization options, select ‘Preview and Export PDF’ at the bottom of the pop-up to populate a preview of the PDF with the options you’ve selected. If it doesn’t look right, readjust the export settings or modify sections/row-breaks in your folio to adjust page sizes. Once the preview looks how you want it to, select ‘Export‘ and then ‘Download’ it as a PDF. Xtensio will even automatically save your settings for future exports!